The episode starts with a bunch of 20 year old Arizona punks skateboarding in the pool of the White’s post-apocalyptic abandoned home. Despite Walter being a master chemist, he is returning to his old home to obtain a small amount of ricin poisoning. Seems like he should just make more. Hank reacts to less than damning evidence that Walter White is indeed Heisenberg by having a panic attack and crashing into the neighbor’s front yard. Hank would officially be the worst poker player in the world. Jesse had 4 lines in this episode but when you have his stare your face tells the story. Saul “the lawyer” has mastered the art of asking a question and then deciding that he doesn't want to know the answer to the question. When Jesse tells him to give 2.5 million dollars each to the families of his and Walters victims Saul agrees. However, as soon as Jesse leaves, Saul goes to his drawer of burners (thank you The Wire) and rats out Jesse to Walter. Jesse and Walt have a talk. Walt swears Mike is alive and Jesse stares. 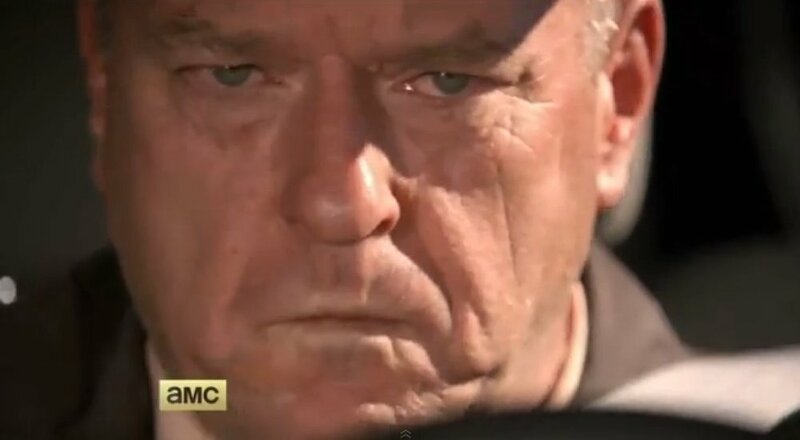 Walt tells Jesse that Walt is retired and Jesse stares. Walt tells Jesse that Jesse should keep the 5 million dollars because he earned it … and Jesse stares. It scares me to think that every conversation that I’m going to have with my son in 10 years is going to go just like that scene. The episode ends with a Hank and Walt showdown. It’s pretty rare for Breaking Bad to have this pivotal of a scene so early in the season but with only 8 episodes this year what do you have to lose? After Hank punches Walter in the face and accuses him of being Heisenberg Walter delivers his second greatest line of the series (“say my name” is still number 1). It was a great start to what promises to be a great end. There is little to no chance this series will go out the same way HBO’s The Sopranos did. Walter is going to die. The question is who will pull the trigger? Posted on August 12, 2013 by Sure Bud and tagged Breaking Bad Walter White.